Most of us went to a zoo at some point in our childhoods. In the earlier days, the animals were often exhibited behind metal bars, in small cages, barren of any furnishings. The exhibits felt like specimen boxes with visitors simply looking at the animals. Even today, visitors still experience this in some zoos. Within the last decade, a vast array of zoos, aquariums and safari parks have sprung up throughout China, estimated at more than 200 according to the Chinese Association of Zoological Gardens. With a growing affluent population, how does a new zoo capitalise on this potential and set an example for all future zoos? 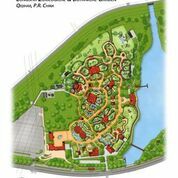 This article outlines the design of Longsha Zoological and Botanical Garden in China. Longsha Zoological and Botanical Garden is a new park that opened in June 2014, located just beyond the downtown core of Qiqihar. With a population of five million, it is the second largest city in the north-eastern province of Heilongjiang. 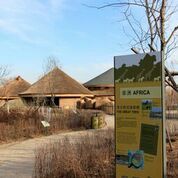 Built on former agricultural and aquacultural land, the 32 ha park has become a trendsetter for zoo design in China. The design was founded upon international standards for animal care and welfare, natural science education and interpretation, and visitor interactivity and entertainment. All animal holding, management and exhibit spaces were designed to meet or exceed the standards established by AZA and EAZA. The park’s exhibit and interactive displays are bi-lingual in Mandarin Chinese and English. The wayfinding signs use four languages: Mandarin, English, Japanese and Korean. The project set a challenge for the design team: create an interactive experience that connects visitors with animals in a natural setting that is fun, educational and promotes multi-generational communication. The approach to the physical layout was to merge the interpretive content into the exhibits. Interactive elements were strategically located within each zone. The conservation and educational messages are integrated with, not additive to, the animal viewing. The overall design results in a broad-ranged and meaningful experience that instils empathy for nature and wild animals. How Do Visitors Experience the Zoo? The physical organisation of the park was designed to provide distinct habitats that simulate the earth’s biomes and other geographical zones, wherein plants, animals and interpretive elements are integrated to bring the visitors multi-layered and unexpected connections both within and outside of the local region. The new park offers generous outdoor and indoor animal exhibits to bridge the mild summer and severe winter (© PJA). Local climatic imperatives: At latitude 47° N, the seasonal temperatures swing from low –40 °C to high 30 °C, dictating the need for interior and exterior animal and visitor spaces. Most animal species have generously sized outdoor and indoor enclosures. Outdoor exhibits use solar orientation to create micro-habitats. Large, free-range, mixed-species habitats allow herd animals the freedom of movement. Indoor habitats provide ample visitor viewing and animal comfort during the long winter months, achieved through the use of geothermal in-floor heating, skylights for natural daylighting and solar gain, and enrichment elements such as hot and cool rocks, feeders and drinkers. Habitat zones: Animals are exhibited in their natural habitats, simulating specific biomes such as wetlands, grasslands, temperate forest and tropical rainforest. Plants are selected to mimic the natural environment found in each biome and can be sourced easily from local nurseries. Interpretive signs explain the biomes, each with a world classification map, graphics, images and text of the associated plants and animals. Geographical links: Thematic elements are designed to immerse visitors in the natural and cultural surroundings of Asia, Australia, North America, northern Europe and Africa. Regional character and context are reinforced through visual cues, such as artificial geological formations and human elements in architecture, arts and crafts. For example, visitor viewing shelters take on the look of vernacular architecture found near the animals’ native habitats. These elements accentuate and enrich a visitor’s connection within each zone. Conservation actions: Expressed through interpretive graphics for each biome and animal, conservation messages raise awareness of local, regional and worldwide issues, and inspire visitors to take specific actions. For example, one entire exhibit zone is dedicated to global wetland bird species, as Qiqihar is known as the “Crane City” for its proximity to Zhalong Nature Reserve. This wetland is home to six of the 15 crane species, including the endangered red-crowned crane. Of the 2,000 remaining worldwide, 400 return here to nest every year. A bi-lingual story sign marks each exhibit entry to prepare the visitors for the experience beyond (© PJA). What Do Visitors Take away from the Zoo? Our design intent was to guide visitors’ interaction through multi-sensory activities whenever possible. Transitioning from one zone to the next, visitors read text and graphics that illustrate each biome, describe plant characteristics and highlight conservation issues. Upon entering the exhibits, large story and animal identification signs focus visitors’ attention to observe animals closely and see their physical adaptations and behaviours. Within each zone, interactive elements encourage the visitors to touch, do and play. The Hunters illustrates predator strategies of hunting prey, alone or in groups, and use of speed, stamina and stalking. Animal Parents discusses different breeding and rearing strategies including single versus multiple offspring. 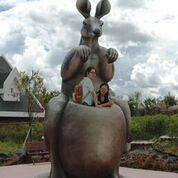 Kangaroo Pouch: Visitors pop up from the oversized pouch to experience how a mother kangaroo cares for the baby joey. And it is a perfect opportunity for a photo! Hibernation Cave: Children crawl in the cave to find life-sized animal sculptures and discover how they conserve energy by sleeping and slowing their heart rate and breathing when food is unavailable. Visitors explore how a mother kangaroo cares for the baby joey (© PJA). In addition, Texas Farm is a dedicated area that highlights how humans live with and care for animals, and how we manipulate nature for our survival. Upon meeting a variety of domesticated animals, children milk a cow, climb on farm animal sculptures and straw bales, and play on farming equipment, such as a corn crib, a tractor and a windmill. Animal Symbiosis: “Unlikely Partners” uses activities to show how seemingly unrelated species cooperate for mutual benefit, such as dung beetle and elephant. Animal Architecture: “Making Structure” enables visitors to explore shelters that animals and people build to raise their young, store food and provide security and comfort. Examples include a human igloo and weaver (bird) nests. Animal Society: “Living Together” compares solitary animals (giant panda), social groups (dolphin pod), pairs (cranes), family units (gibbons) and social insects (bee colony). Children play a game of “dung balls” through the air tubes and into the dung beetle burrows (© PJA). Throughout the park, visitors are immersed in thematically relevant surroundings, and engaged in activities directly tied to the biomes and animals. The educational messages are conveyed through multi-sensory experiences, and the play opportunities are purposely and conveniently placed for children to not only burn off energy but also learn about nature. The take-away is a greater personal connection and deeper respect for animals and the environment. With its burgeoning middle class, increased leisure time and public interest in wild animals, China is a fertile ground for advancing the ideas of a modern zoo. 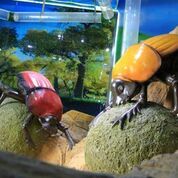 Longsha Zoological and Botanical Garden has set new standards in order to offer a multi-dimensional experience, encourage visitor interactivity, stimulate communication among families and impart knowledge of animals and plants, all in an attractive and comfortable environment. It is a testament to a client group willing to challenge cultural norms, cater to visitor needs and consumer demands, and significantly redefine the meaning of a zoo. The park has seen steady attendance increases, even during the winter months when bone-chilling temperatures generally limit visitation. The park has been granted a 4A class tourism rating from the central government Bureau of Tourism. The city of Qiqihar also supports the new zoo through expanded tourism programmes and transportation improvements, which attract visitors from the vicinity of a two-hour drive. Longsha Zoological and Botanical Garden has bridged a tourism gap in this industrial city, and will continue to serve as a fun, entertaining and educational destination for generations to come.